With just five ingredients, this recipe for roasted delicata squash uses fresh thyme and olive oil for a simple and delicious side dish. 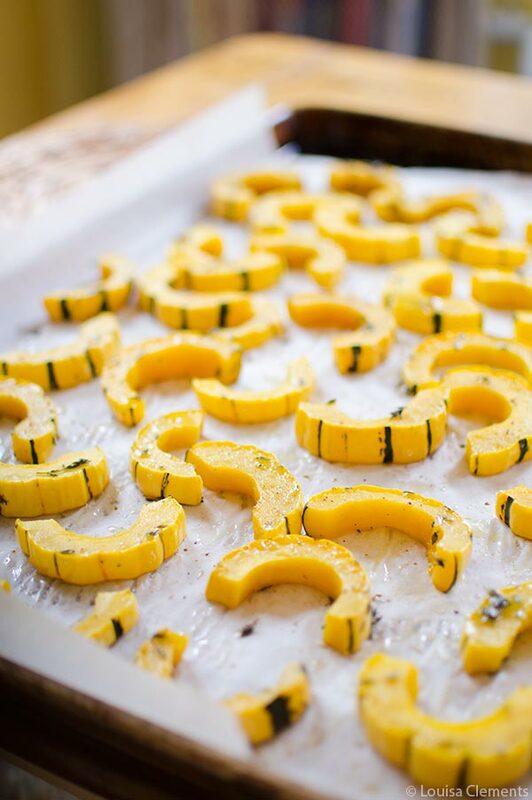 Squash is at its peak right now and this recipe for roasted delicata squash should be added to your fall bucket list. As crazy as everyone goes for pumpkin spice everything, I’m most excited about all the varieties of winter squash out there. There are hundreds of varieties and I suggest you head out to the store and pick out every kind of squash you can find (I saw them on sale for $0.99 each the other day). A quick tip to keep in mind for storing squash, they last for 1-3 months, so if you can carry them, buy a few extras and store them in a cool, dark place for later. I spent last weekend up at my Grandmother’s cottage in Fenelon Falls, Ontario. On the way up, I drove by an Amish farm stand that had tables upon tables filled with the most beautiful array of squash. I couldn’t stop right then, but I knew that I would be heading back before the weekend was over. 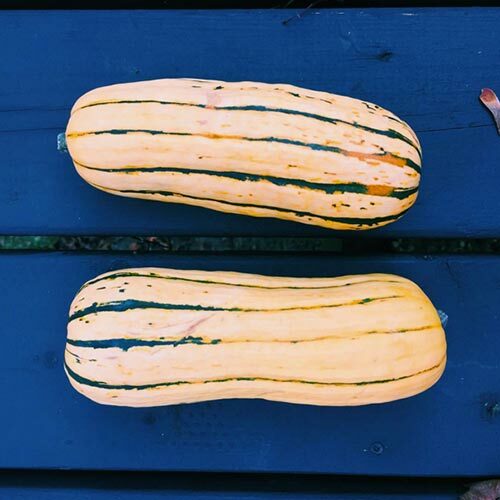 The next morning, I found myself at the farm stand browsing the variety of squash; they had acorn and butternut but there were also hubbard, spaghetti and of course, delicata. 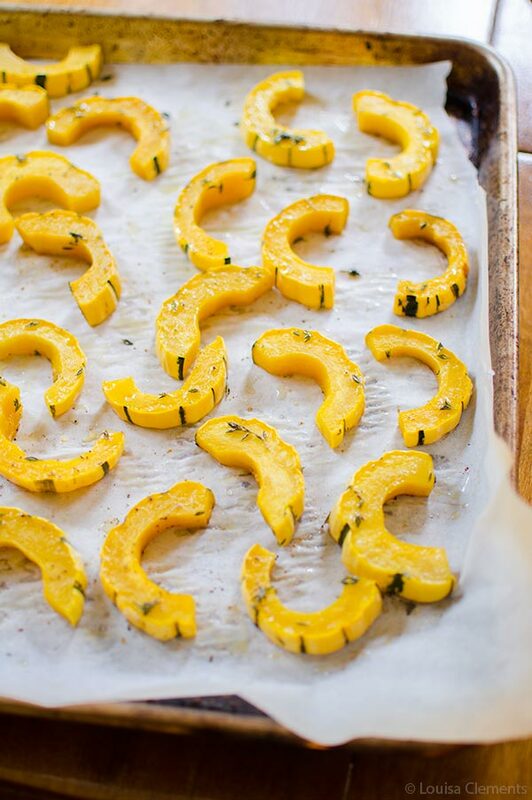 I find delicata squash to be one of the most beautiful varieties, so I couldn’t resist picking up a few and started to work on this roasted squash recipe. I love delicata because the skin is edible, so they take a lot less time to prep than other squash varieties. I plan my editorial calendar at least three months in advance, but I’ve come to realize that despite this planning, when the inspiration strikes, I wind up abandoning what I had planned and following my intuition and inspiration. 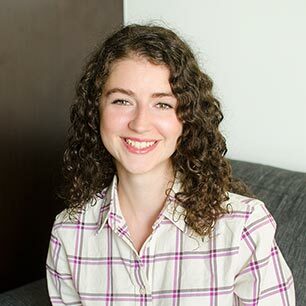 I’ve been working on the idea of presence and exploring it in my writing over the past year or so, and I think it’s helping me to feel more inspired by my surroundings and my everyday. And as Oprah once said “Be here now“, this is fiercely important. So, how do you cook delicata squash? I think roasting is the best way to prepare it. To cook it in the oven, just remove the seeds then slice into 1/2″ slices and roast for 20 minutes at 400F. It’s as easy as that. I think in terms of squash, delicata is one of the easiest to prepare because the skin is edible which means it doesn’t need to be peeled. I also find that the oblong shape is a lot easier to handle than the other oddly shaped squash. I’m pretty smitten with this winter squash, can’t you tell? As delicious as the sweet, yellow flesh is on its own, I wanted to jazz this up a bit with fresh herbs. This recipe requires only five ingredients, in addition to the squash I used olive oil, fresh thyme, a touch of vinegar and salt. It’s so simple, but sometimes simplicity is the best thing, especially when it comes to food. When produce is in-season, there isn’t very much you need to do to it to make it shine. I think that’s one of the most important things I’ve learned food-wise in the past little while, sometimes you just need to let ingredients do the talking. Preheat oven to 400F. Line a baking sheet with parchment. Toss squash with olive oil, thyme and balsamic vinegar. Sprinkle with salt. Arrange on the prepared baking sheet and roast in the oven for 18-20 minutes. Enjoy the bounty of this season and try my roasted delicata squash with thyme, let me know how it goes.